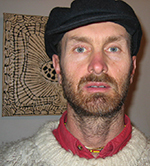 Dr Marty Branagan has written extensively on the connections between environmental and peace issues, such as through his 2013 book — Global Warming, Militarism and Nonviolence: The Art of Active Resistance — which examines the carbon footprint of war and militarism, and how to reduce it through, inter alia, nonviolent direct action and constructive programmes. He has also written about learning in social movements; the use of humour; nonviolence against ruthless regimes; and developments in nonviolence and artistic activism which have occurred during Australian environmental movements. Marty's contributions to the 2014 special edition of International Journal of Rural Law and Policy — 'Mining in a Sustainable World' — arose from the 2013 UNE conference ‘Mining in a Sustainable World: Environmental, Social, and Political Economic Issues’.